Now in summer in Japan, we can hear the cicadas singing loudly or noisily even beyond the windows. I have visited some countries in Asia in summer since 1990, but never seen cicadas or heard them singing there though I think there should be some there. 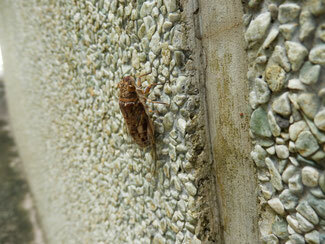 But for the first time in my life, I saw a cicada in Singapore the other day and confirmed its existence. It looks the same as a meimuna opalifera in size but a little different in appearance from any other one in Japan.